Clutch, a mobile application for iPhone and Android which aims to combine gift cards, coupons, comparison shopping, gifting, and personalized recommendations all under one roof, has raised $5 million in Series B funding, the startup is announcing today. In addition, Clutch is also acquiring ProfitPoint, a provider of gift card and loyalty platforms for merchants. The funding round was led by Safeguard Scientifics, Inc., an investor in technology companies like Beyond.com, as well as in healthcare, as with its recent funding of Medivo, for example. Clutch’s previous investor Ben Franklin Technology Partners also contributed to the new round. Unlike many of today’s mobile shopping apps, which generally focus on one piece of the shopping experiences – like mobile couponing, deals alerts, or personalized shopping feeds (as with services like Wish or Wanelo, for instance) – Clutch instead has a different vision which involves it replacing a number of services with one app that does it all. Users can download the Clutch app from Google Play or the iTunes App Store, then load it up with their gift cards, loyalty cards, tickets, coupons, and more – sort of like an expanded version of Apple’s Passbook, but one that can also integrate with Passbook, if users choose. Though to some extent, the app competes with other mobile shopping companions and wallet apps like Lemon or Square, it differentiates itself by the variety of use cases supported. As noted above, the app doesn’t just serve as a wallet replacement. It also offers a barcode scanner for finding the best prices, social shopping via Facebook integration, mobile gifting, and personal product recommendations, among other things. 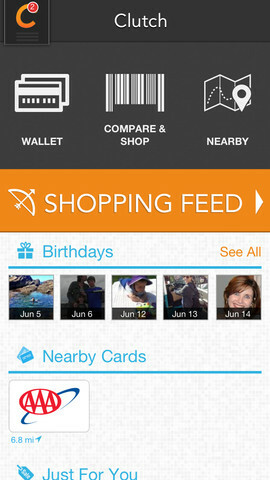 As users save items to their own wish lists, they can then be alerted to nearby deals and coupons, too. Frankly, it’s a lot of features to take in for the average user, but the app does a decent enough job at not overcluttering its user interface with the options available. You could argue that the app targets a slightly different kind of mobile shopper, as well. Rather than going after the younger demographic playing around with social product aggregators like the above-mentioned Wish and Wanelo, or Fresh, Fancy, Polyvore, and others, Clutch is more interested in the deal seeker – one who’s willing to share their personal shopping data with retailers in return for loyalty points and more targeted offers. That puts Clutch up against other mobile apps in the loyalty space like Shopkick or CardStar, then. At launch, the company leveraged relationships with brands like Adidas, FTD, SpaFinder, and Maui Jim, to encourage sign-ups through gift card giveaways. But while Clutch is positioned today as a consumer-facing mobile app, the company is now working on building tools for retailers looking to tie together offline, online and mobile loyalty into one platform. That is, it’s planning to branch out and offer retailers their own fully-branded, white labeled application which will offer mobile shopping, reloadable gift cards, stored loyalty points, offers, and more. This is the opportunity which Safeguard saw – that more mid-size retailers are trying to build their own versions of something like the Starbucks mobile application, for instance. The ProfitPoint acquisition means to help with these efforts, as it brings in over 3,000 merchant clients, plus a merchant card processing platform. Clutch had previously acquired Sqoot a local deals aggregator, which rounded up data from Groupon, Living Social, Yelp and dozens of others. Philadelphia-based Clutch hasn’t done much marketing for its initial, beta version of the consumer mobile app, which today has over 20,000 users, the company tells us. Following the raise, the funds will be used to better develop and market the mobile app, as well as build out the B2B platform, due out later this year.